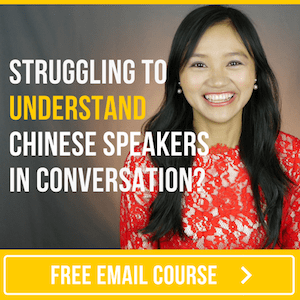 In a previous post, I showed you how to learn Chinese with music and introduced 6 songs to get you started. Today... I’ve got another 6 for you! zhè shì yī shǒu zuì jìn hěn huǒ de gē qǔ. xiàn zài wǎng luò shàng yǐ jīng yǒu gè zhǒng fān chàng de bǎn běn le. gē cí jiǎng shù le yī duì qíng lǚ zhī jiān chū xiàn le gǎn qíng wèn tí. tā men tòng kǔ fēn shǒu de gù shì. This is a recent hit song. There are already various cover versions of it on the internet. The lyrics are about a couple that had problems in their relationship. It's a painful story about their breakup. You can find Pinyin lyrics here. dāng nǐ dì yī cì tīng dào zhè shǒu gē de shí hòu, nǐ huì yǒu shén me gǎn jué ne? duì le! jiù shì fēi cháng kuài lè de gǎn jué! zhè shǒu gē tè bié róng yì shàng kǒu. gē cí chāo jí jiǎn dān. zhè shǒu gē gǎn jué yǒu diǎn xiàng ér gē. yī tīng jiù huì chàng le. As you're hearing this song for the first time, what feeling do you get..? Right! A feeling of happiness! This song is really catchy. And the lyrics are super simple. This song feels a bit like a children's song. You can sing it after hearing it once. táo zhé de zhǎo zì jǐ. zhè shì yī shǒu chōng mǎn zhèng néng liàng de gē. gē cí jiǎng shù le yī zhǒng shēng huó de tài dù. zài zhè gè chōng mǎn yòu huò de shì jiè lǐ, bù yào wàng jì le zì jǐ. yào zhǎo dào zhēn zhèng de zì jǐ, jiān chí zì jǐ de mèng xiǎng, bù fàng qì! "Zhao Zi Ji" by Tao Zhe. This is a song full of positive energy. The lyrics are about an attitude towards life. Don't get lost in this world full of temptations. Find your true self, stick to your dreams, don't give up! rú guǒ nǐ xǐ huān shuō chàng huò zhě xī hā de huà, wǒ tuī jiàn nǐ tīng yī xià cài jiàn yǎ hé rè gǒu duì chàng de zhè shǒu gē. zhè shǒu gē jì lù le xiàn dài ài qíng de yī zhǒng zhuàng tài. zài MV zhōng, cài jiàn yǎ hé nán zhǔ jiǎo fā shēng le yī duàn ài mèi de gǎn qíng. qiáng diào huó zài dāng xià, zhǐ yào zhēn xīn fù chū xiǎng shòu. bù zhí zhuó yú cháng jiǔ. If you like rap or hip hop, I recommend you listen to this song by Cai Jianya and MC Hot Dog. This song captures a state of "modern love". In the music video, Cai Jianya and the main actor have an "ambiguous" relationship. Emphasizing that they live in the moment, just truly enjoying themselves. Not committing to a long-term relationship. wáng lì hóng de ài de jiù shì nǐ. zhè shǒu gē yòu tián mì yòu làng màn, shì yī shǒu jīng diǎn de qíng gē. wáng lì hóng tā jīng tōng duō zhǒng yuè qì. tā hái huì shuō yī kǒu liú lì de zhōng wén hé yīng wén. tā shì yī gè quán fāng wèi de yì rén. yě shì zhòng duō nǚ xīn zhōng de bái mǎ wáng zi. "Ai De Jiu Shi Ni" by Wang Lihong. This song is sweet and romantic, and is a classic love song. Wang Lihong is proficient in a variety of musical instruments. He is also fluent in both Chinese and English. He is an all-round artist. And he's also "prince charming" in many girls' hearts. cài yī lín de shuō ài nǐ. zhè shì yī shǒu diàn yǐng de zhǔ tí qǔ. gē qǔ de jié zòu hěn qīng kuài. zhěng shǒu gē chōng mǎn le kuài lè de qì fēn. zhè wèi nǚ gē shǒu hěn shàn zhǎng wǔ dǎo. rú guǒ nǐ xǐ huān tiào wǔ de huà, nǐ kě yǐ kàn yī xià tā de Music videos. tā de MV tǐng yǒu yì sī de. "Shuo Ai Ni" by Cai Yilin. This is the theme song of a movie. The rhythm of the song is brisk. The whole song has a pleasant vibe to it. This female singer is really good at dancing. If you like dancing, you can take a look at her music video(s). Her music videos are very interesting.